After a herculean effort from Habanero with the original Zeus game, the developers have returned with another lofty effort for Zeus 2 slot. The second game has plenty for fans of the series, of which there are plenty, and it should keep other slot aficionados relatively content too. The answer is quite simple really – the first game was just too successful to not get a second outing. There were calls from Zeus fans for another game and those calls got so frequent that it would have been silly if Habanero didn’t listen to them. But is this sequel any good? The answer is yes, but with a little bit of a caveat; there are one or two issues which could be easily solved. The gameplay is decent, but at times the graphics look a little aged and the paytable is far from the most generous we have ever seen. If the ancient mythology floats your boat, then you will already know the story of Zeus and all the other Greek gods. Thus, you will really enjoy the Zeus 2 slot as they have done their homework and the setting fits perfectly. There are 5 reels and 3 rows with 25 pay lines to play for all you folks willing to give it a go. The mighty scatter, Zeus, turns up every now and again with a lightning bolt of free spins. Three or more of him will provide you with a minimum of 10 free spins. There is a great bonus card feature which gives players the chance to double their winnings too. The chances to win are pretty plentiful and that’s only a good thing when it comes slots. It also has that most wonderful of things in a slot – the progressive jackpot! This can be won at any time and could give a big and unexpected boost to your bankroll. Anyone who has ever been lucky enough to hit one of these knows how fantastic they are when you win one. The paytable could be a little better though, but if you hit a good winning sequence, then that’s nothing to worry about. As we said, the symbols are what you would expect from a game that makes players yearn for the warm days of the Greek summer. There’s a harp, ships amphora and papyrus rolls… the story basically is, if it’s Greek, it’s probably there. However, the backdrop of a mythical Greek city is a little basic for our liking. They definitely could have put a little more work into these graphics, but it’s a minor thing, so we will let it go. 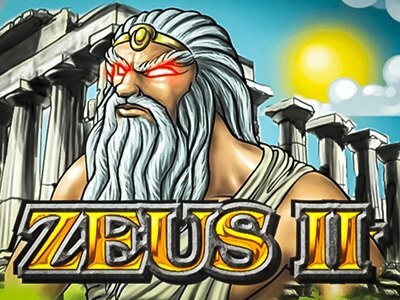 Overall, we think that Zeus 2 slot machine is a game that fans of the original Zeus will embrace. However, if you weren’t really into the first game then you can probably give it a miss.